With Earth Day earlier this week, and since I had a lot of milk jugs leftover from these votives, I decided to try my hand at another "milk jug" project. 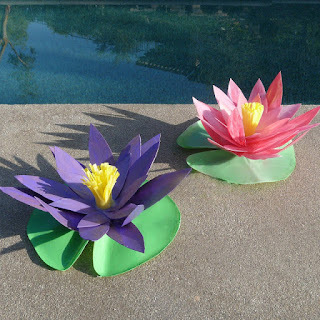 Water lilies are one of my favorite flowers; They're beautiful, vibrant and they grow in ponds. Awesome. My love for water lilies goes way back. My 14-year old self had a bedroom decorated with Monet's water lilies prints (I even had an impressionist water lilies bed spread!) and when I first traveled to France 15 years ago, visiting Monet's home and gardens was one of the highlights of the trip. It was at his home in Giverny that Monet maintained a beautiful water garden which inspired his famous Water Lilies (les nymphéas) series. So with water lilies and dreams of outdoor dining on the brain, I decided to come up with a centerpiece for our patio table. Remove the handle and base of the milk jug. But don't throw anything away just yet! Make a template for your petals. 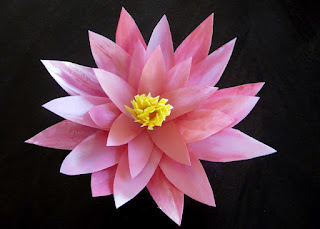 I used three sizes-- 2-inch small petals; 3-inch medium petals; 4-inch large petals. Cut out your petals from the milk container-- 11 small petals, 8 medium petals and 8 large petals. Bend the bottom of each petal. Use a multi-surface acrylic paint to paint each petal. 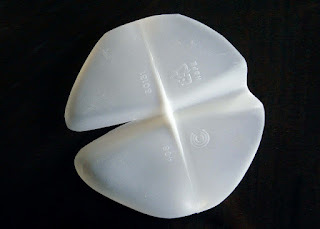 Cut out a 6-inch strip of polyethylene (the material that the jug is made from) and fringe it. This will become the stamen. 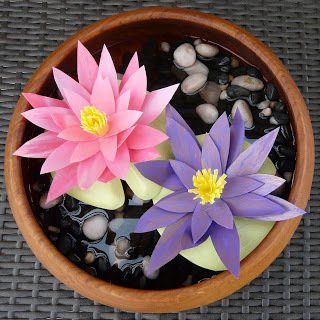 Paint the petals and the stamen with multi-surface acrylic paints. I painted the backs of the petals (the outside of the milk jug) since the color shows through. I also mixed paints to soften the color and add dimension-- I mixed in pearl white (for the pink) and gold (for the purple). You can also add highlights to each petal using the pearl & gold paints. 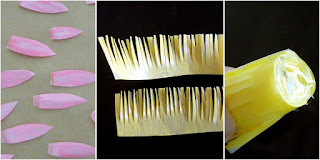 After the paint dries, roll the fringed piece and use a big dollop of hot glue on the bottom to hold it together. This will become the stamen of the flower. 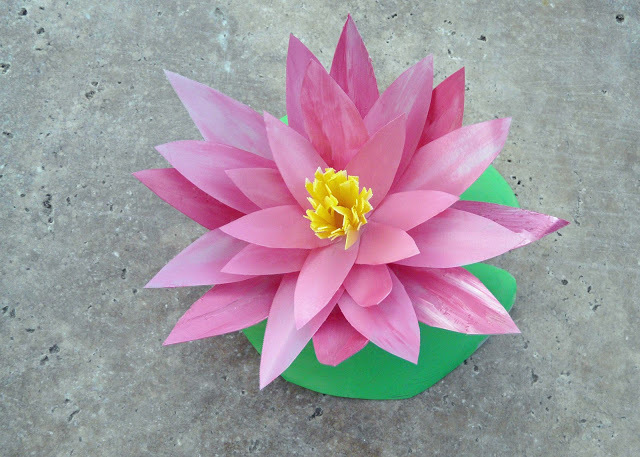 Once the glue and paints are dry, it's time to start adhering the petals to the stamen. 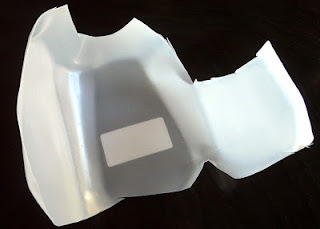 If you want your project to be water resistant, use clear adhesive sealant. It takes longer to dry, but will hold better if you decide to display your flowers on/near water. Start with the smallest petals. Bend the ends of each petal. I found it easiest to work upside down, overlapping and gluing down each petal to the base of the stamen. Using a hot glue gun works if 1) you're not planning on getting your flowers wet and 2) paint is being glued to paint. It's not the strongest bond, but it works for decorative purposes. 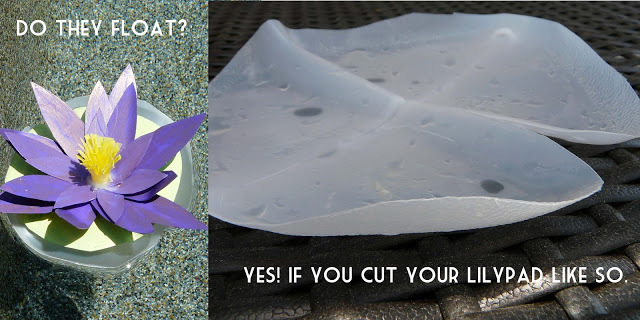 Using clear adhesive sealer works if 1) you're planning on using your flowers outside or near water 2) plastic is being glued to plastic. So don't paint the parts that are being glued together with adhesive sealer! I did this by painting the back of the petals. 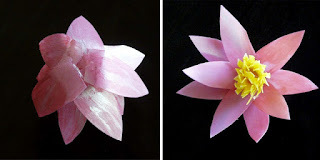 The part of the petal that is glued to the stamen is paint-free and has a nice bond. Make sure the sealer is clear (and thus 100% dry) before putting it near water. Or you can add a lily pad. I cut mine out of the base of the milk jug. Paint it green and you're almost done! When the paint is dry, adhere the flower to the lily pad. If you're wondering... my water lilies don't float! I tested them in the pool. They stay up a little before sinking... the flower is too heavy. 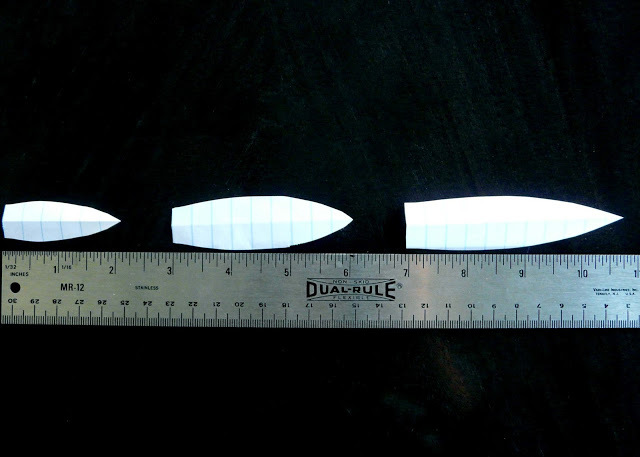 However, with some adjustments to the lily pad (maybe a bigger lip), I think it can be done! I've been getting a lot of emails asking "DO THEY FLOAT?" So I decided to try out my theory that if you left a little lip on the lily pad, it would float. It works! Behold the milk jug water lilies that actually float!